Sulwhasoo’s Malaysia latest Store in Mid Valley Megamall features the latest fifth-generation design, exclusive holistic products and and starter kits. This is Sulwhaso’s second stand-alone store here in Malaysia, the first was in Sunway Pyramid. The design of their Mid Valley Megamall store depicts different facets of the brand’s values but still in line with Sulwhasoo’s brand philosophy. The store’s overall design brings together traditional and modern elements that serves to communicate the brand legacy, harmony and balance, to everyone. Basically this store design is inspired by the ultimate beauty of plum blossoms. A delicate chandelier shaped as plum blossoms compliments the Asian Wisdom Zone showcases Sulwhasoo’s heritage ingredients predominantly traditional Korean herbal medicine. Accented with materials reminiscent of traditional Korean paper, or ‘hanji’, Sulwhasoo’s new store conveys Korean beauty and sentiments to consumers. Aside from the existing skincare and makeup range, the new store will carry boutique-exclusive products such as the limited edition Sulwhasoo Lantern Series, First Peace and Plum Blossom candles and potpourri, the brand’s complete range of herbal soaps, body range and starter sets. “With the opening of the Mid Valley Megamall boutique, we aim to provide consumers of all backgrounds access to exclusive holistic products, such as our scent products, body products as well as offering affordable starter kits of our signature product, First Care Activating Serum EX.” said Lau Shin Yee, Brand General Manager of Sulwhasoo Malaysia. 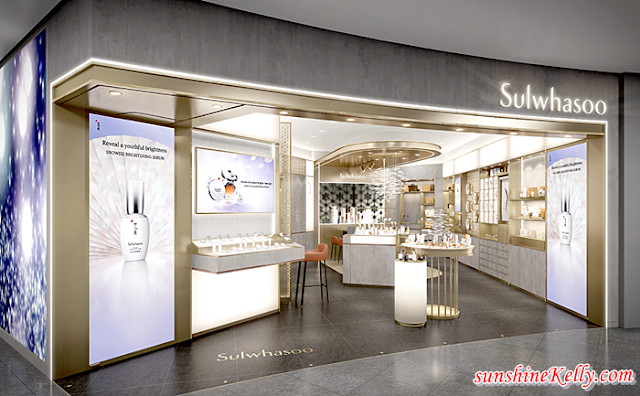 Sulwhasoo’s Mid Valley Megamall boutique also encapsulates a First Care Zone and Concentrated Ginseng Renewing Zone, where you can experience Sulwhasoo’s best-selling signature products such as First Care Activating Serum EX and Concentrated Ginseng Renewing Cream EX. Taking a unique approach to beauty regimes, Sulwhasoo encourages its consumers to use the First Care Activating Serum EX as the first step in skincare routines in order to restore balance and radiance. Another key product is the Concentrated Ginseng Renewing Cream EX which is the pinnacle of Sulwhasoo’s 50-year ginseng research that harnesses the resilient vitality of ginseng to combat aging problems. In line with their philosophy of harmony and balance, Sulwhasoo brings experience for the five senses - sight, touch, scent, sound and taste - within the store. Location: G-095, Ground Floor, Mid Valley Megamall, Kuala Lumpur.